These gorgeous earrings are 13cm in length and feature a combination of gorgeous pom poms, black satin tassels, and faux pearls. The perfect choice if you're looking for a statement piece for your next evening cocktail party or bridal shower lunch. 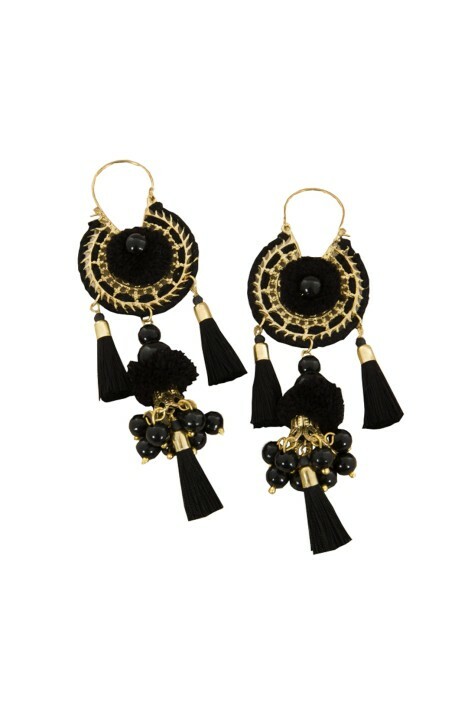 Make a bold statement at your next event with these amazingly ornate earrings by Adorne. Hire an understated off-the-shoulders mini or free flowing maxi to complement the look. Complete your look with a pair of slender heels and a black clutch pod available to rent. Finish with relaxed curls for a super effortless glam look and topped off with a bold red lip. For more tips read our blog post ‘Our Favourite Summer Trend – Off The Shoulder’.